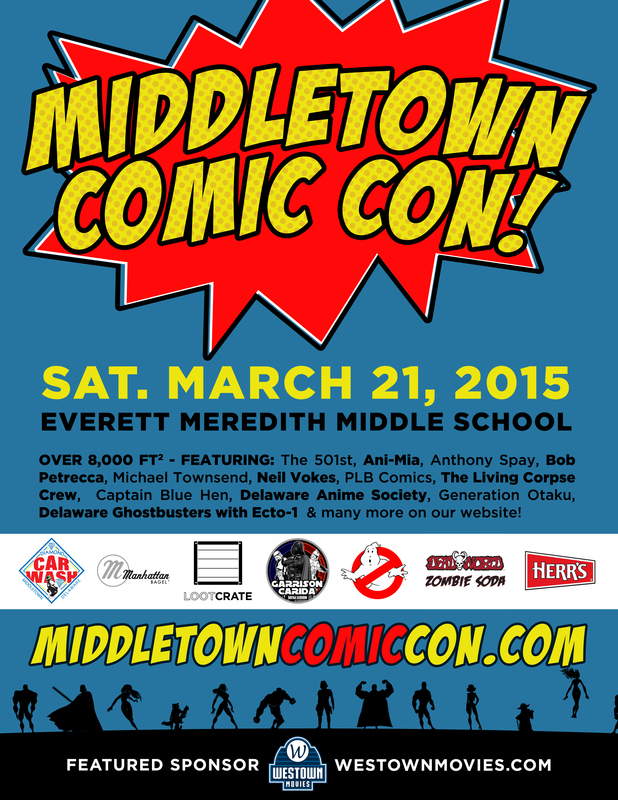 Middletown Comic Con This Saturday! Team Dash will have a table at Middletown Comic Con (otherwise known as Galactic Con) in Middletown Delaware this Saturday! If you are in the area we hope to see you! With the awesome Kirk Van Lund! In a week from today Dash issue 1 will be out and available in shops and online! It almost seems unreal that Delia and I have been working on this comic for two years now and it’s finally happening. So lets party! 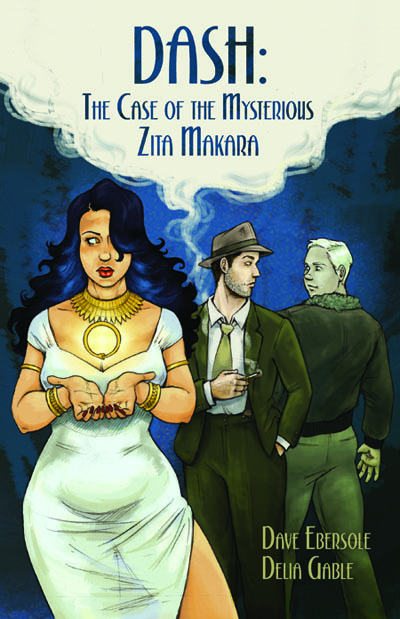 We’ve mentioned that we’re having a launch party for the series before, but here is all the nitty gritty info. WHAT TIME: Doors open at 7pm! 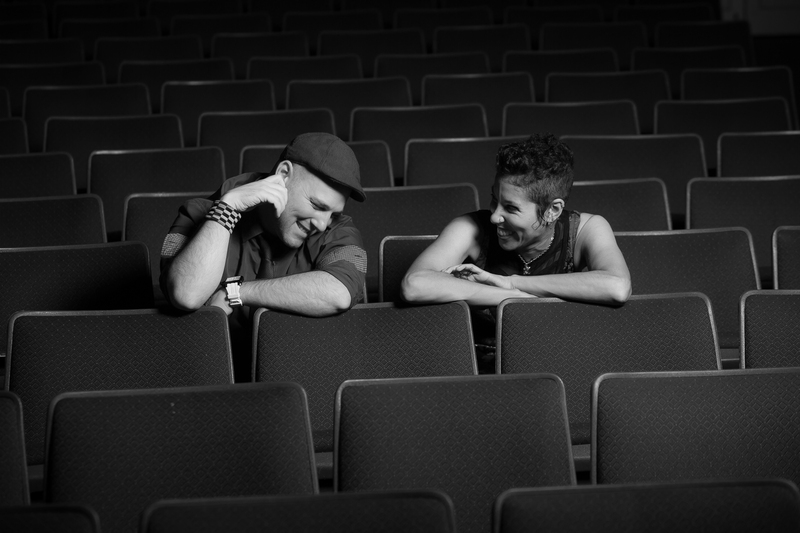 Doors open at 7pm with live music featuring the singer Deborah Billups and a 3 piece combo of Chris Tolomeo, Jay Ronca, and Steve Bickell. 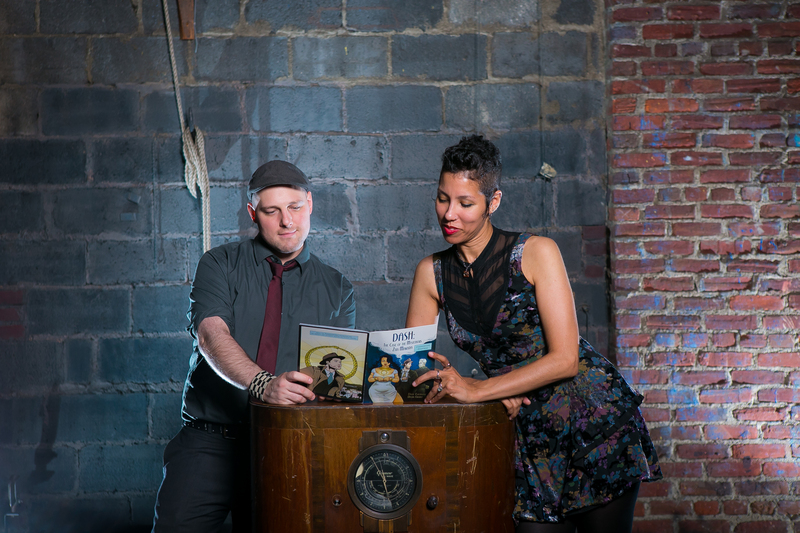 At 8 pm a live 1940s style radio play of the first issue of Dash starring Peter Zielinski, Sara Luciano, Christopher Tolomeo, Shanna Massad, Jay Mazzola, Cathy Gibbons Mostek, and Rich Lee. Afterwards we’re going to throw on some big band music and have a 1940’s with a dance party! HOW MUCH: Tickets are $15.00 which includes a free drink and a copy of Dash 1 signed by Delia and myself. WHAT DO I WEAR: While it is not mandatory at all, we’re encouraging everyone to come dressed as you would if you were to going to a dance party in the 1940s. We’re both looking forward to launching this series in style with everyone! Ok, it’s been a very long time since either of us has updated. Like since right before last Halloween long time, and all I can really say is…. HAPPY NEW YEAR! Hope 2014 has been treating everyone great; it’s been rather a busy time for us. 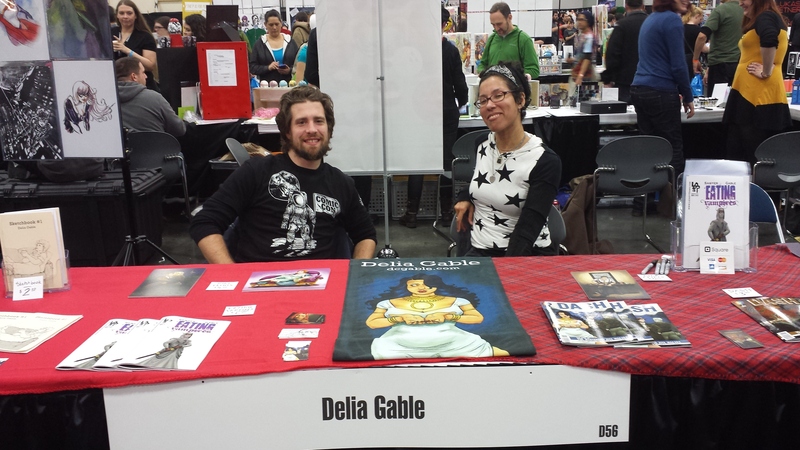 Delia just got back from Emerald City Con (so jealous) and is gearing up for MoCCA Fest where she’ll be sharing a table with illustrator Elisabeth Alba.Table F3. They’ll both be selling some great stuff so be sure to drop by, table F3. Our first issue has been completed and I love it. We are currently in the middle of the pitch process and it’s very exciting. I couldn’t be more proud of the work we’ve done on this comic; I can’t wait to get it in people’s hands. I wish there was a way for you to see it, even if only a small preview of it. Oh wait, there is! We only have a limited number of these preview books so be sure to pick it up! MoCCA Fest is this weekend (April 5th & 6th ) Saturday and Sunday in Manhattan at: The 69th Regiment Armory, 68 Lexington Avenue, between E. 25th & E. 26th Street, New York, NY 10010. Be sure to head over to table F3 to grab this exclusive preview book. Also Sunday I’m going to be a jerk and will be hanging around the table as well, so stop by and say hi. 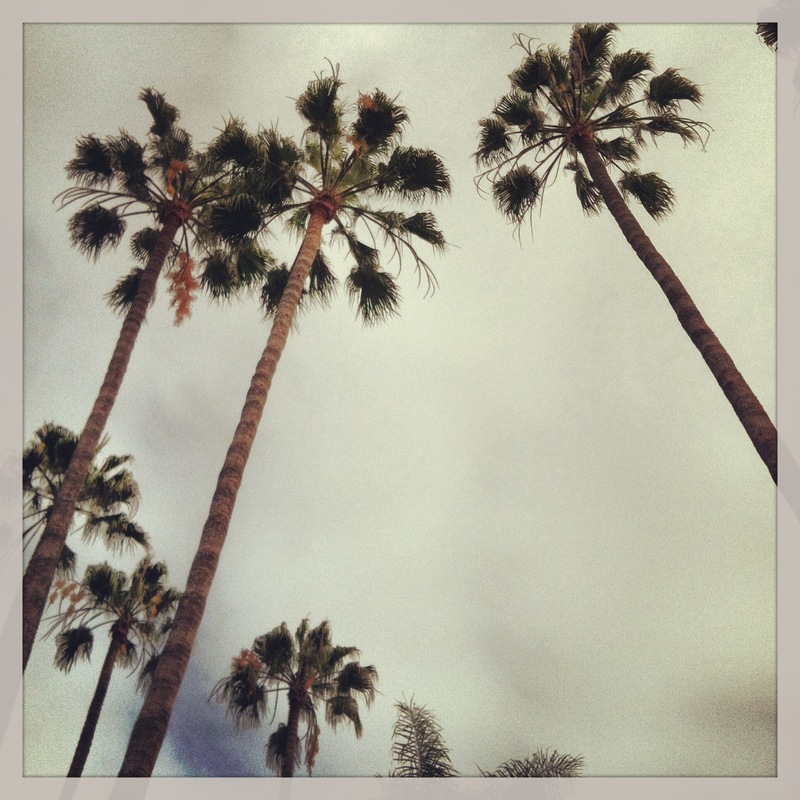 I sometimes think everybody from the East Coast has West Coast dreams or envy or whatever. Maybe I’m generalizing here, maybe I’m off base about it, and maybe it’s just me. But it has always been me. Since I started regularly checking out Roman Polanski’s film Chinatown from my public library at the age of eleven (which was abruptly put to an end when I asked my mother how someone could be someone’s sister AND daughter), I’ve been fascinated by California in general and Los Angeles in particular. So last year, after Delia got back from San Diego Comic Con and told me next year I was going with her, there was no question I was counting down the days! It’s been a little less than two months since I got back and I think I can say, without a doubt, the trip was one of the most amazing, overwhelming, and inspiring adventures I’ve been on. 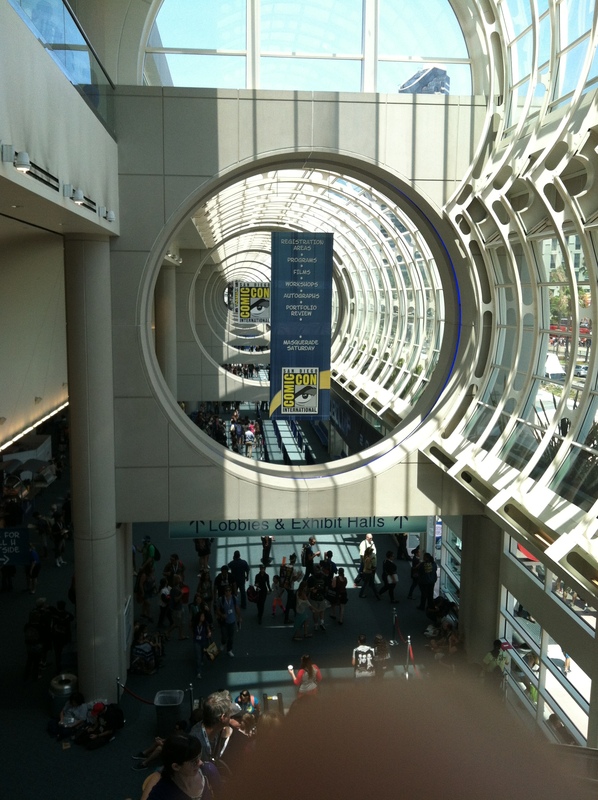 SDCC itself was everything that everyone said it would be: just massively overwhelming, lots of fun, and super informative. Some of the wonderful and inspiring panels I attended: Breaking Into Comics and Staying In; Black Mask: Bringing a Punk Rock Sensibility, Activism, and Wu-Tang to Comics; Writers Unite: Pitching and Writing Creator-Owned Comics; Shattering Convention in Comic Book Storytelling; and Full-Time Creative Work on a Part-Time Schedule. 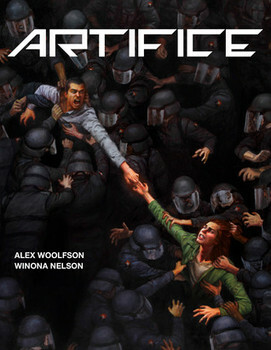 I got to stop by the Prism Comics booth too and chatted with some awesome creators there, and picked up a pretty great book called Artifice by Alex Woolfson and Winona Nelson. 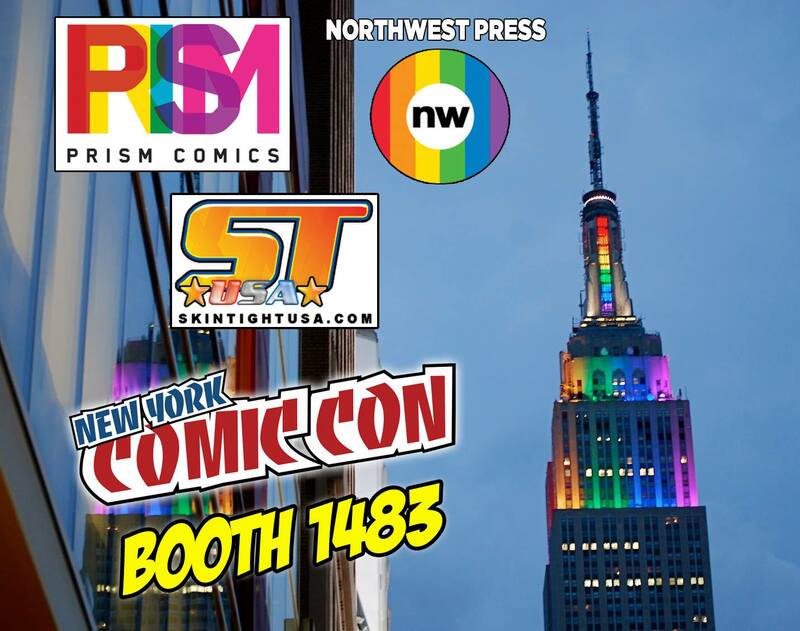 Everyone I met at the Prism booth were some of the nicest, warmest, and most generous people at the Con! 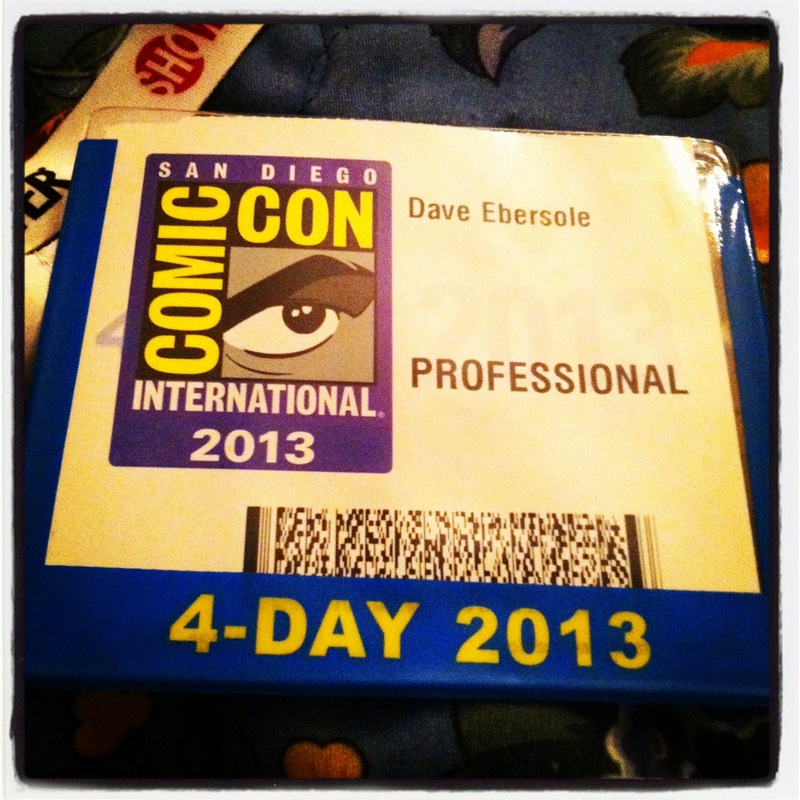 While I loved every crowded, jam packed moment of Comic Con (and I’ll admit I now understand what “con-exhaustion” is), hearing other creators talk about their work only wanted me to work harder on mine. 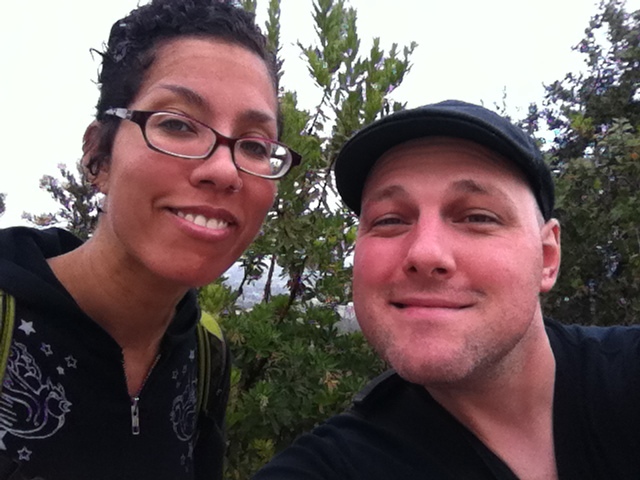 So on Saturday Delia and I skipped the Con and took a train up to LA to do some real onsite research for our comic. 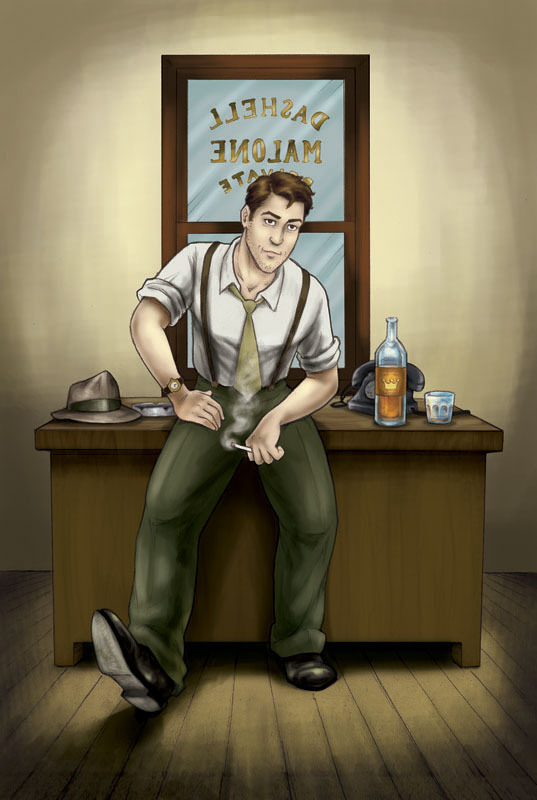 Dash is a comic set in Los Angeles in the first few months of the year 1940. And while I can’t get there without a time machine (one day, one day! ), upon visiting the city– all of the pictures, maps, and websites I’ve spent long hours studying suddenly became real. 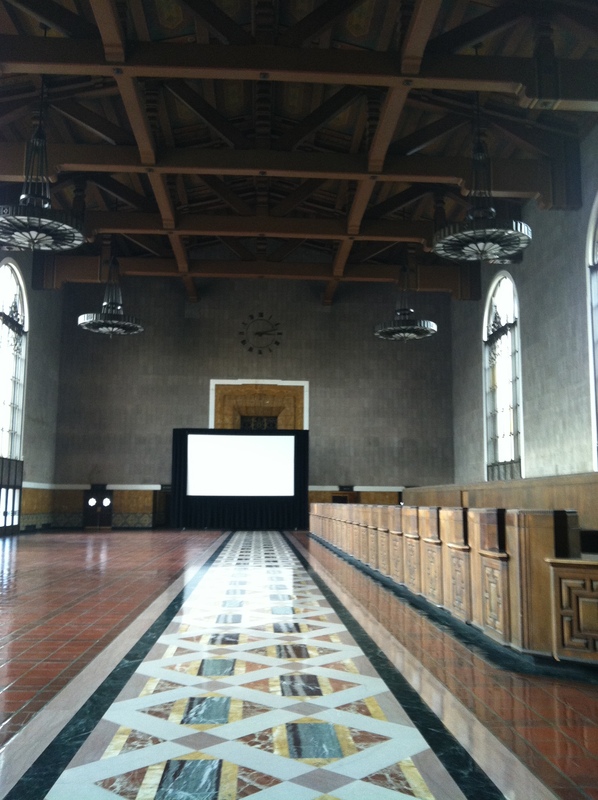 Our train pulled into Union Station and we spent a good hour just walking around and taking as many reference pictures as possible. 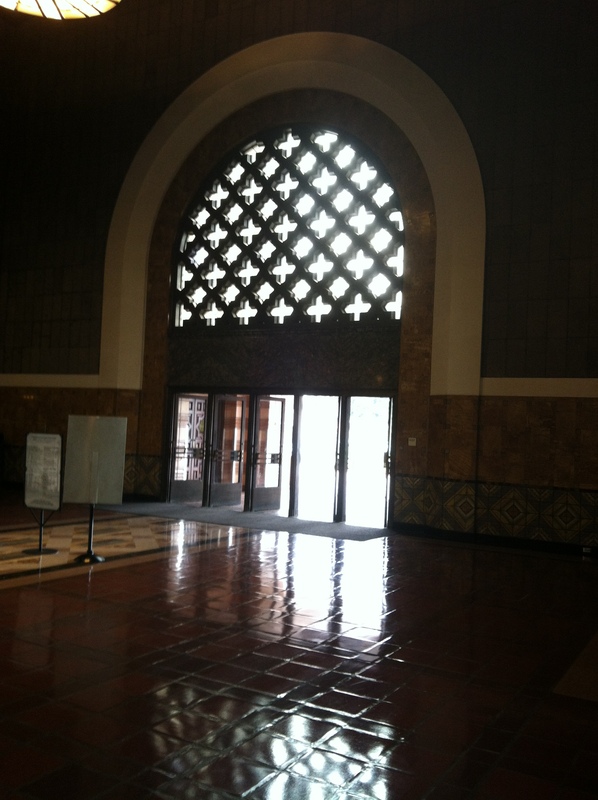 What we discovered poking around is that Union Station opened its doors on May 3rd 1939, about eleven months before our comic starts. 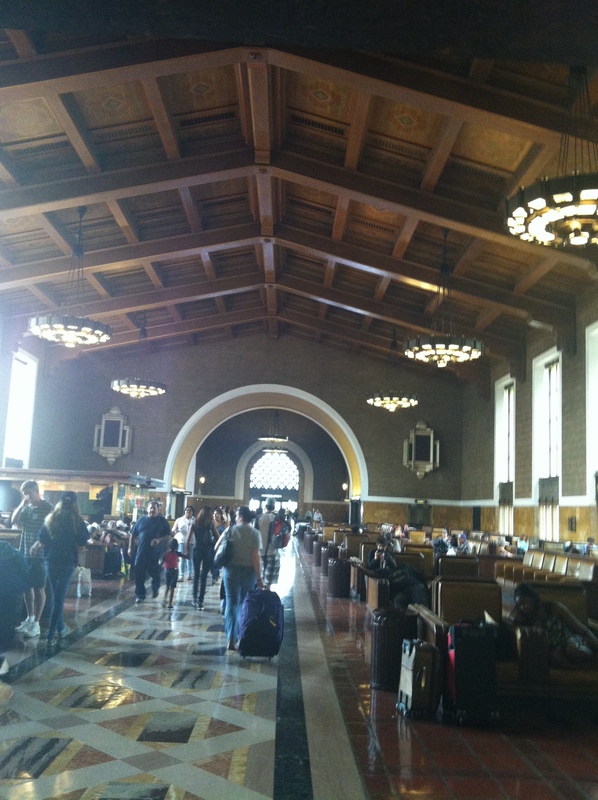 With a building as historic as Union Station (considered one of the last “GREAT” American Stations), we couldn’t ask for more of a time capsule of what it would’ve been like in LA at the beginning of 1940’s. It was the next best thing to being there. There were a few sections closed to the public. One was what seemed to be a lunch counter/ restaurant; the other– the part of the station where people could originally purchase their train tickets. 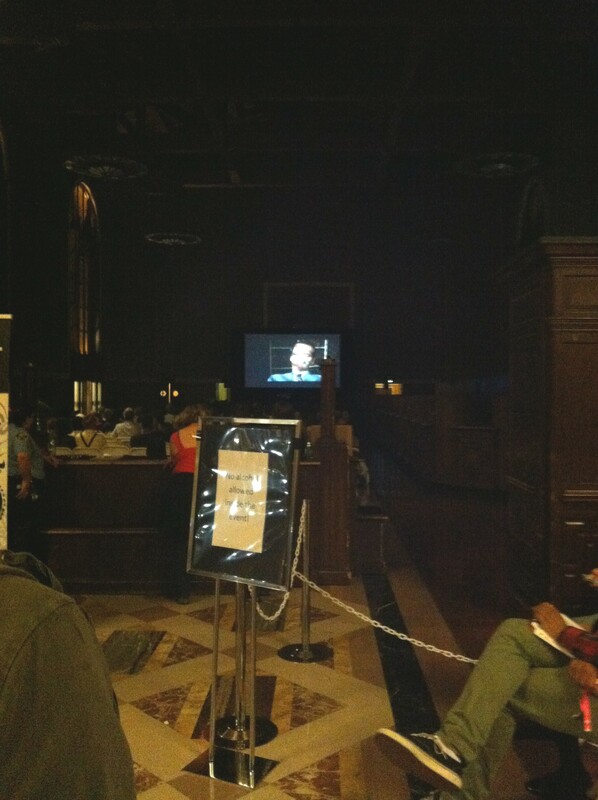 In this latter section there was a big modern screen…more on that later. 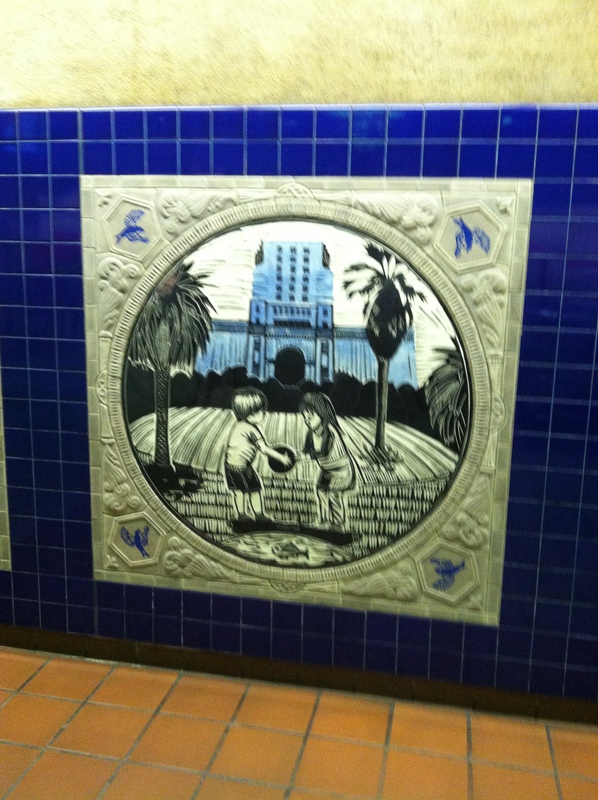 From there we took the Red Line to the Westlake/ Macarthur Park station. 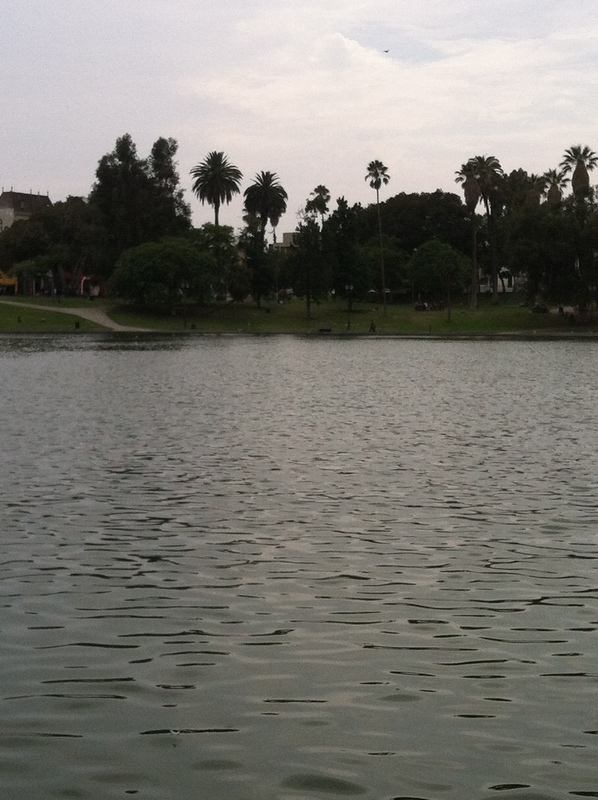 Once here, we took a stroll around Macarthur Park, called Westlake Park in 1940. After looking at so many references pictures of the park, it was surreal just being there. Nothing seems to have changed inside the park except for the passing of time. There are a lot of important events that happen in the park in our comic, and it’s a shame this really gorgeous park with a lot of hidden landmarks is still trying to shake the rough reputation it’s attained since the 1980’s. 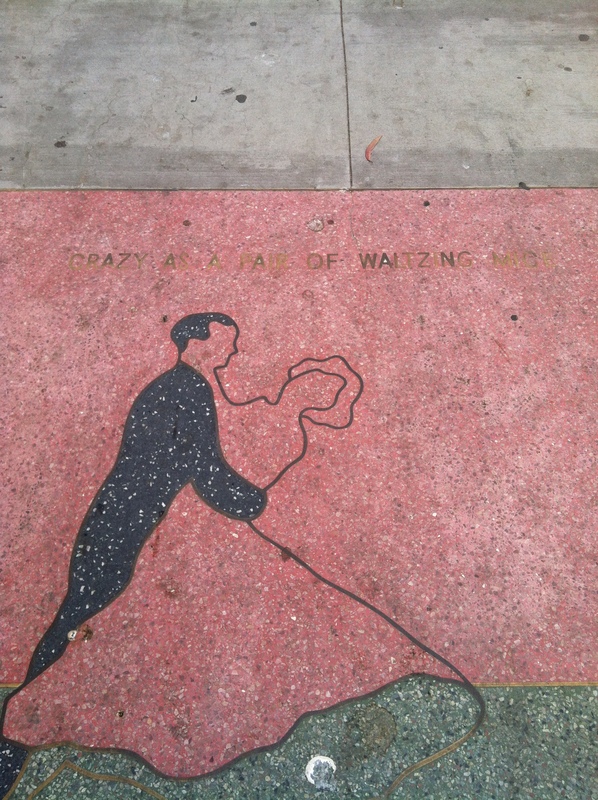 One of the hidden landmarks we came across was this engraved artwork in the pavement which says Crazy as a Pair of Waltzing Mice. After some research I hit myself in the head: it’s a Raymond Chandler Quote from Farewell My Lovely. This park is ripe for a noir story; it’s engraved in its sidewalk! From there we walked up the hill to the Park Plaza Hotel. 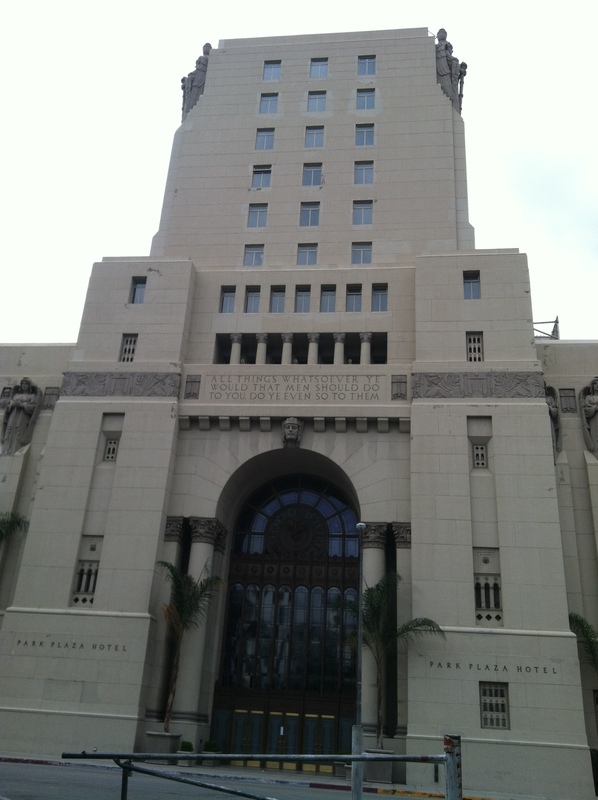 The building was completed in 1924 by The Benevolent and Protective Order of Elks (that’s the BPOE for you cool kids.) 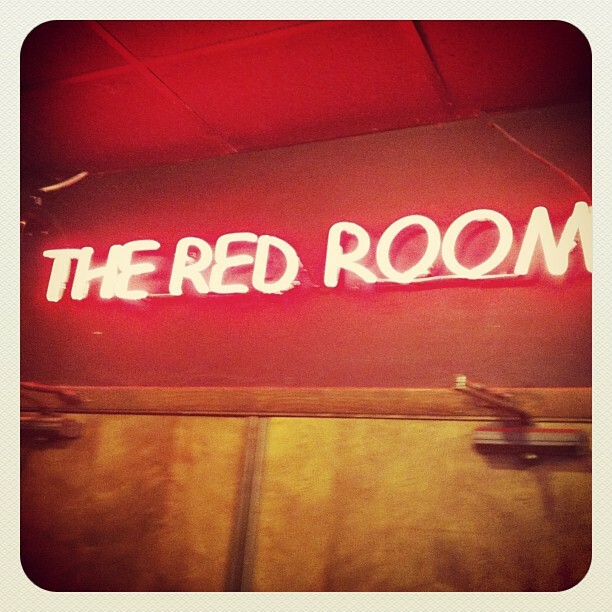 It’s was later sold and is now used primarily for wedding receptions and is one of the most filmed at spots in the city. 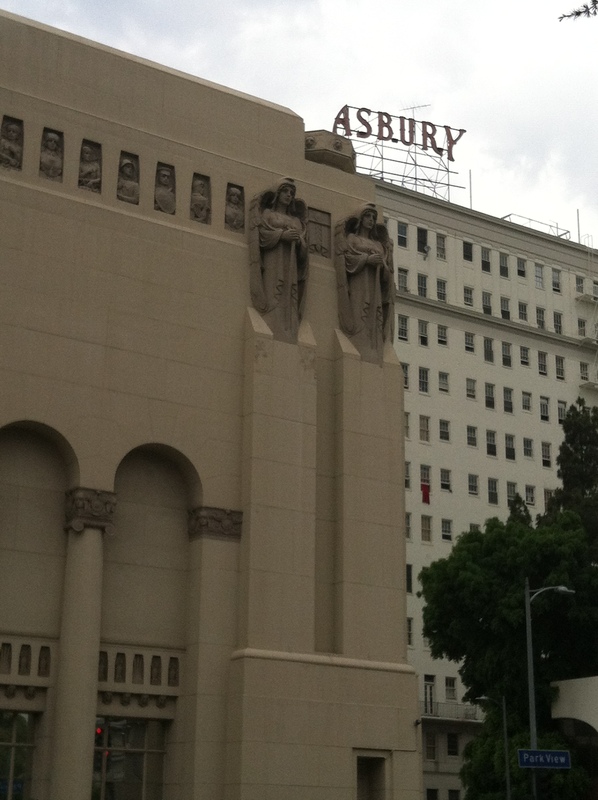 I’m in love with everything about this building and it holds much significance to the larger story we are telling. 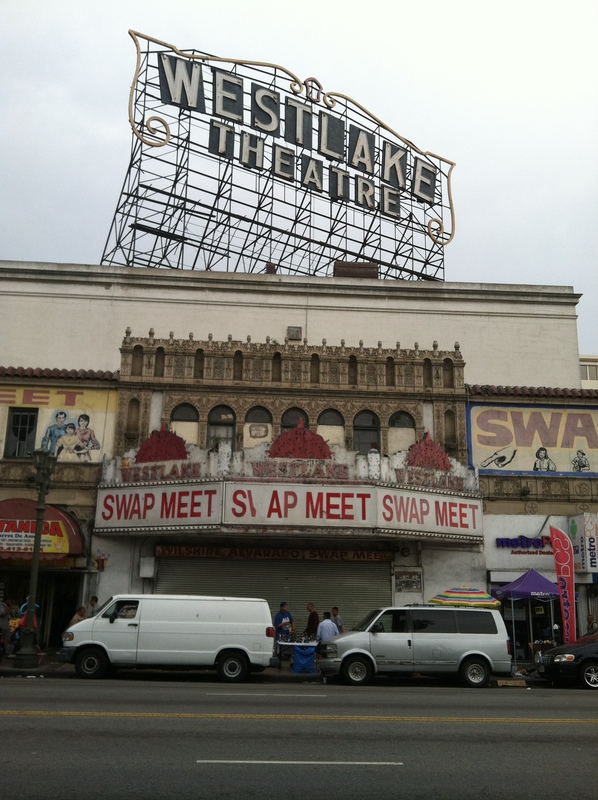 Walking back to the train station, we passed two other landmarks that will pop up in the comic: The Asbury, which used to be host to luxury penthouses; and The Westlake Theater, which used to show vaudeville shows and movies. 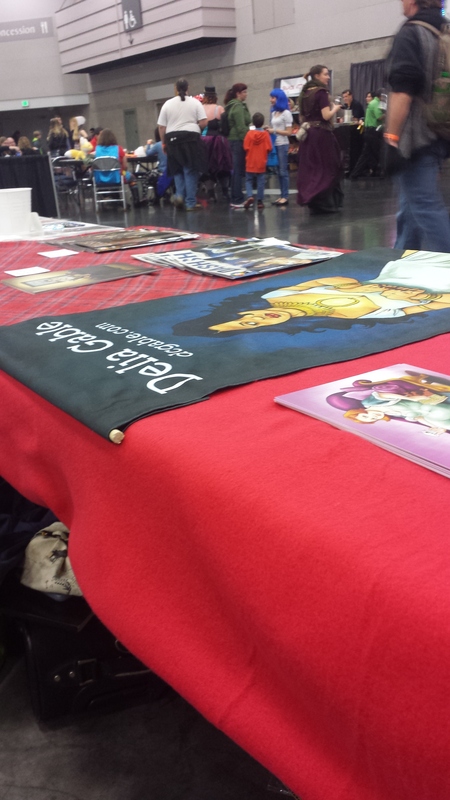 While not prominently featured in the comic, you might be able to catch these two in the background in a few of our panels! 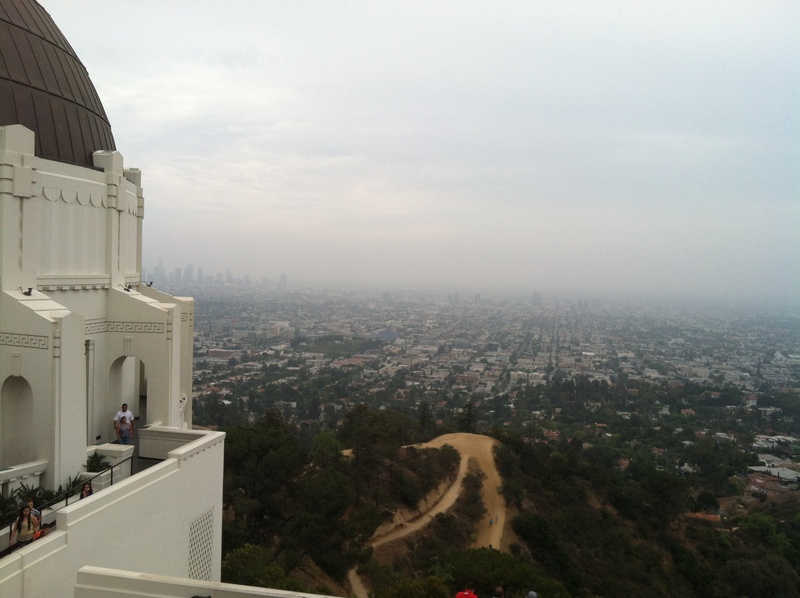 From there we took the Red Line up to Vermont and Sunset and caught a shuttle to a rather well known site in the city, The Griffith Observatory. 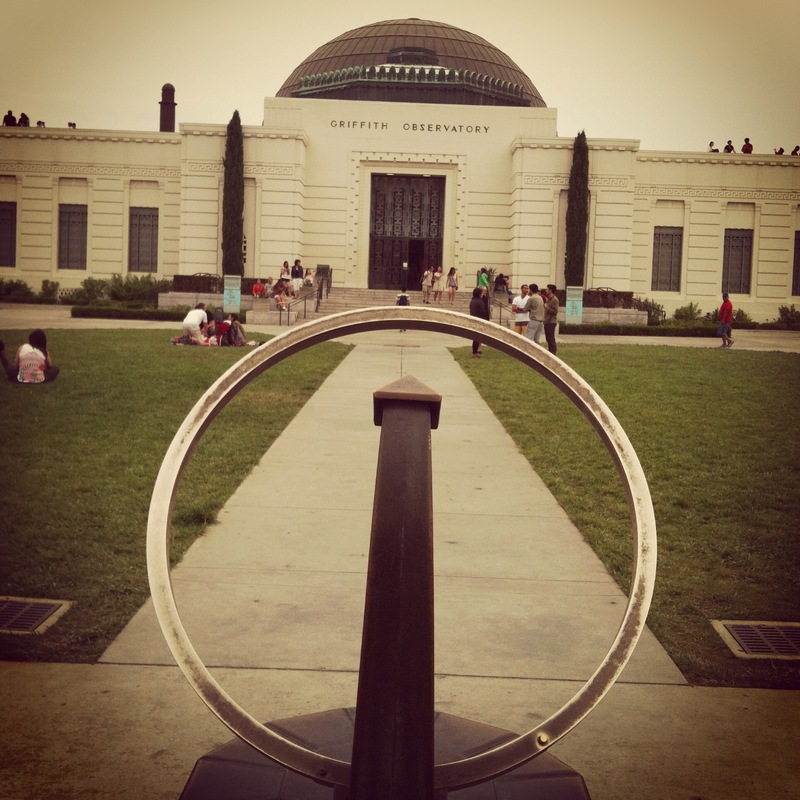 The Observatory will figure hugely in a future case in which our Private Investigator will get embroiled. 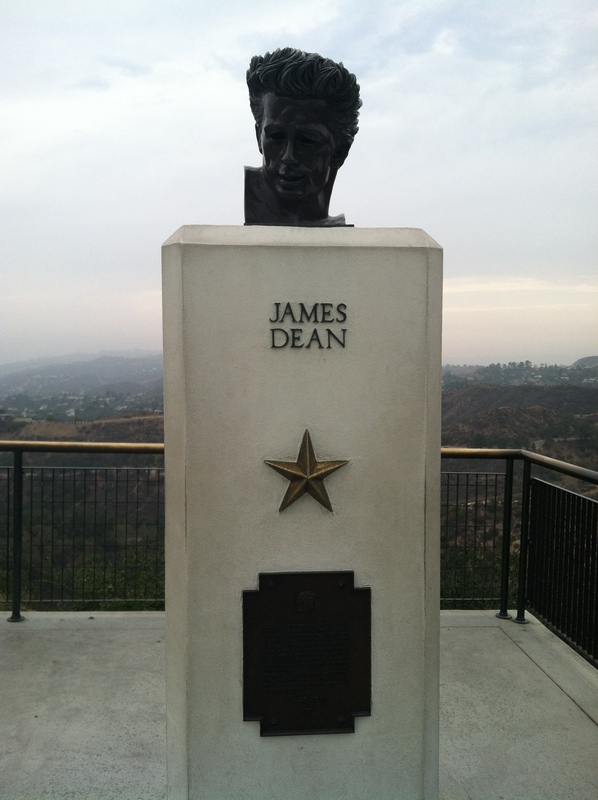 But it also holds a huge significance to me personally, being a huge James Dean fan. I tried not to let that show too much to Delia as we were there and I think I did a decent job. She probably has a different take on my James Dean geek-out. Either way, it was an amazing landmark to capture and we got another round of fantastic reference shots. I’d like to point out here that reference pictures for me as a writer are just as important as they are to an artist. As I write a comic script, I really try to think in visual terms for the artist (in this case Delia) with whom I collaborate. I sometimes can’t get a certain page written if I don’t have the right reference shot. The right reference shot can make your point better than paragraphs and paragraphs of description–and hey that’s kind of what comics are all about anyway, right? 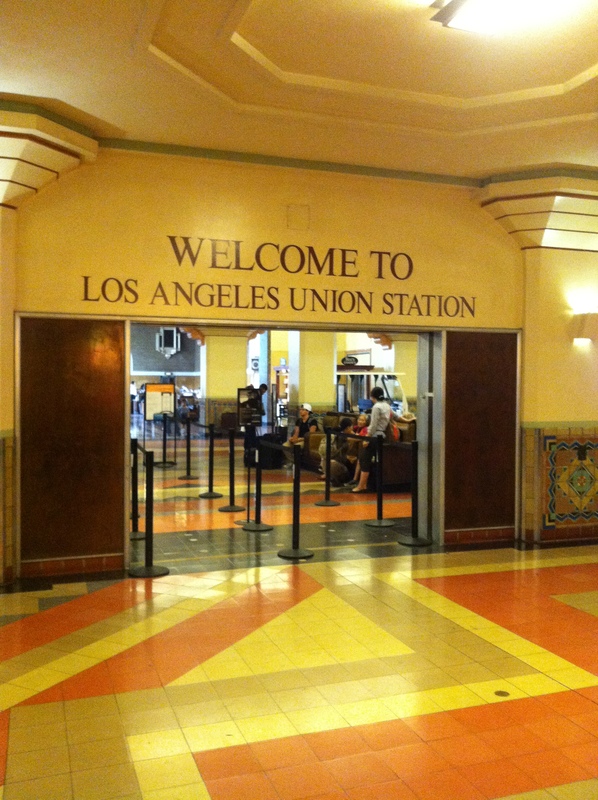 After that we took the Red Line to Hollywood and Vine and Delia and I parted ways for the day. 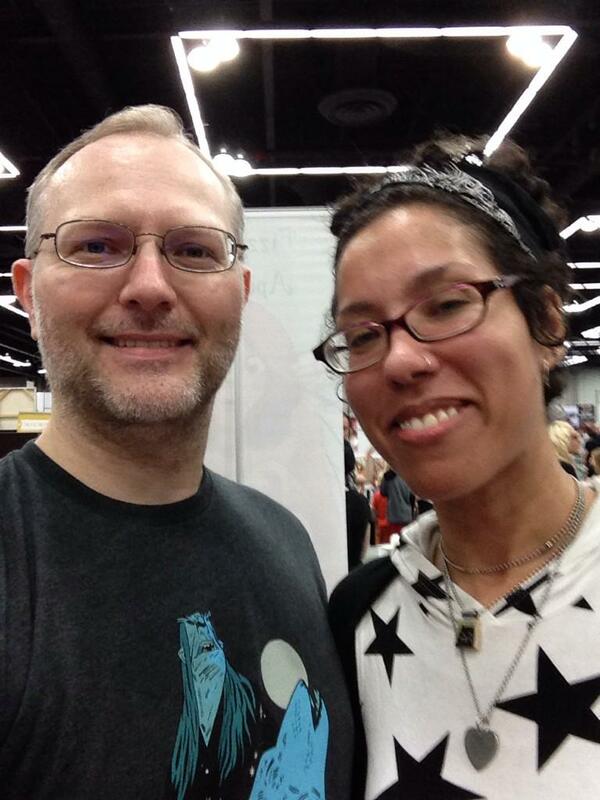 We would meet back at the Con on Sunday for the amazing Full-Time Creative Work on a Part-Time Schedule. 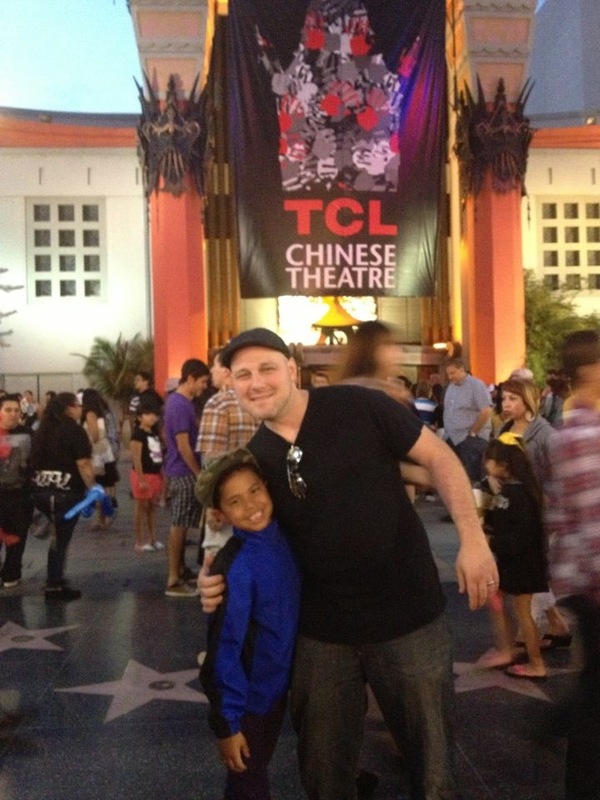 I spent the rest of Saturday with my cousin Jen and her two amazing kids Phoenix and Gigi. She showed me Hollywood Boulevard and we walked around Grauman’s Chinese Theater, which I didn’t think would impress me much. However, the first handprints I saw were Gloria Swanson’s (if you don’t know who that is, go eat some hot sauce), and I was hooked. At the end of the evening, my cousin dropped me back off at Union Station to catch my late night train back to San Diego. Then I saw the purpose of that big screen I had seen earlier in the day: Downtown Film Festival LA was showing a free screening of Chinatown. At age eleven, this is the one film that started my fascination with LA, noir, and private detectives. I was smiling ear to ear as I boarded the train and took my seat. 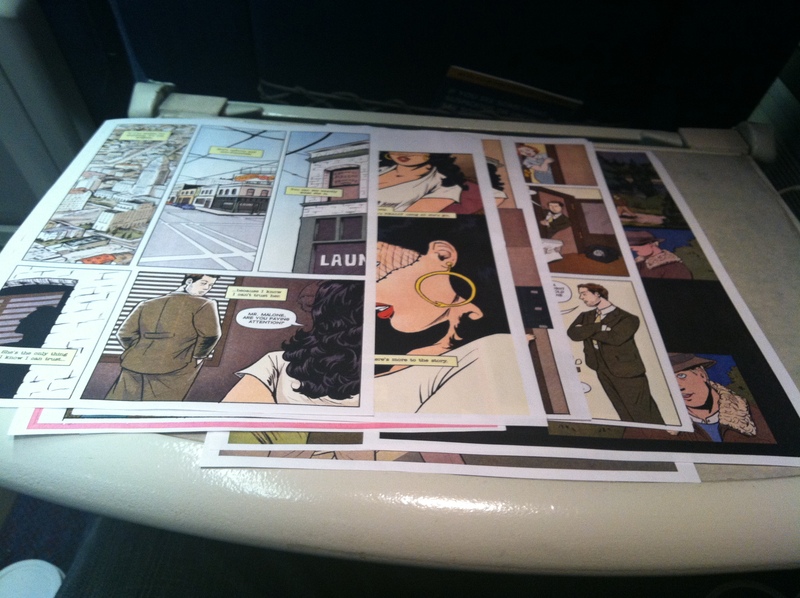 As I was looking over Delia’s freshly printed pages to our first issue, I realized I couldn’t have written a more perfect ending to my daytrip to the City of Angels if I wanted to.